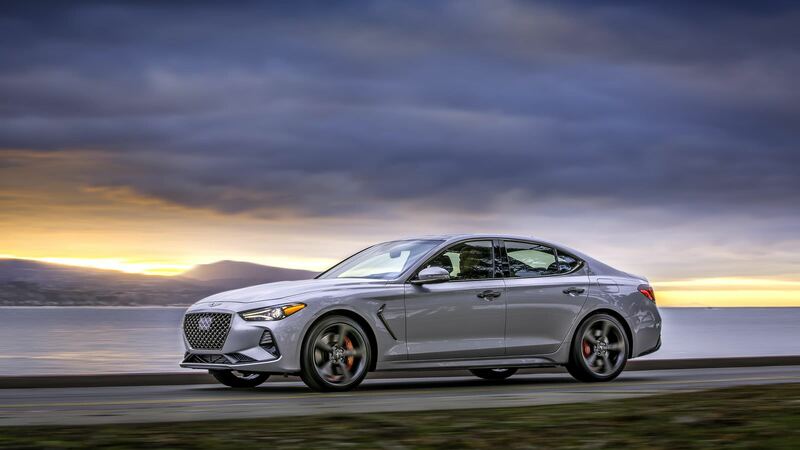 As the G80 and G90 occupy the larger end of the luxury sedan spectrum for Genesis, the arrival of the 2019 G70 finally enters them into the smaller, sportier side of the market. The new sport sedan, which hopes to peel away some customers from the Audi A4, BMW 3 Series and Mercedes-Benz C-Class, made its US debut at the 2018 New York Auto Show. At launch, five trim levels ranging from the entry-level Advanced to the top Sport models and two engines will be offered. A 2.0-liter turbocharged four-cylinder serves as the base engine pumping out 252 horsepower and 260 pound-feet of torque. Those looking for more muscle will want to spring for the 3.3-liter twin-turbocharged V6 with 365 horsepower and 376 pound-feet of twist. Both engines will come with an 8-speed automatic transmission with steering wheel paddle shifters and launch control, but driving purists will be able to get a 6-speed manual gearbox on cars equipped with the 2.0-liter and rear-wheel drive. All-wheel drive is available with both powerplants. To sharpen handling, an optional Dynamic package adds a mechanical limited-slip differential, while four-piston front and two-piston rear Brembo brakes can also be equipped. G70s shod with 19-inch wheels will come wrapped with Michelin Pilot Sport 4 tires to aid in chasing down its German rivals.